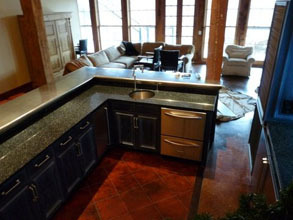 Custom Countertops - #3938 | Handcrafted Metal Inc.
A glorious, grand scale distressed pewter island with sink. 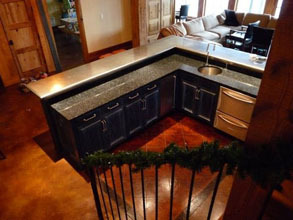 This extraordinary island is completely seamless welded. It covers 4 corner posts and does it all in style with our ornate La Belle edge. Our dentil adds a nice accent on the bottom course of the edge. We built the custom-framed sink opening from a template we made from the actual undermount sink. Distressed pewter, semi-gloss finish. Length: 8" 9" 10" 11" 12" 13" 14" 15" 16" 17" 18" 19" 20" 21" 22" 23" 24" 25" 26" 27" 28" 29" 30" 31" 32" 33" 34" 35" 36" 37" 38" 39" 40" 41" 42" 43" 44" 45" 46" 47" 48" 49" 50" 51" 52" 53" 54" 55" 56" 57" 58" 59" 60" 61" 62" 63" 64" 65" 66" 67" 68" 69" 70" 71" 72" 73" 74" 75" 76" 77" 78" 79" 80" 81" 82" 83" 84" 85" 86" 87" 88" 89" 90" 91" 92" 93" 94" 95" 96" 97" 98" 99" 100" 101" 102" 103" 104" 105" 106" 107" 108" 109" 110" 111" 112" 113" 114" 115" 116" 117" 118" 119" 120" 121" 122" 123" 124" 125" 126" 127" 128" 129" 130" 131" 132" 133" 134" 135" 136" 137" 138" 139" 140" 141" 142" 143" 144" 145" 146" 147" 148" 149" 150" 151" 152" 153" 154" 155" 156" 157" 158" 159" 160" 161" 162" 163" 164" 165" 166" 167" 168" 169" 170" 171" 172" 173" 174" 175" 176" 177" 178" 179" 180" 181" 182" 183" 184" 185" 186" 187" 188" 189" 190" 191" 192" 193" 194" 195" 196" 197" 198" 199" 200" 201" 202" 203" 204" 205" 206" 207" 208" 209" 210" 211" 212" 213" 214" 215" 216" 217" 218" 219" 220" 221" 222" 223" 224" 225" 226" 227" 228" 229" 230" 231" 232" 233" 234" 235" 236" 237" 238" 239" 240" 241" 242" 243" 244" 245" 246" 247" 248" 249" 250" 251" 252" 253" 254" 255" 256" 257" 258" 259" 260" 261" 262" 263" 264" 265" 266" 267" 268" 269" 270" 271" 272" 273" 274" 275" 276" 277" 278" 279" 280" 281" 282" 283" 284" 285" 286" 287" 288" 289" 290" 291" 292" 293" 294" 295" 296" 297" 298" 299" 300" 301" 302" 303" 304" 305" 306" 307" 308" 309" 310" 311" 312" 313" 314" 315" 316" 317" 318" 319" 320" 321" 322" 323" 324" 325" 326" 327" 328" 329" 330" 331" 332" 333" 334" 335" 336" 337" 338" 339" 340" 341" 342" 343" 344" 345" 346" 347" 348" 349" 350" 351" 352" 353" 354" 355" 356" 357" 358" 359" 360" 361" 362" 363" 364" 365" 366" 367" 368" 369" 370" 371" 372" 373" 374" 375" 376" 377" 378" 379" 380" 381" 382" 383" 384" 385" 386" 387" 388" 389" 390" 391" 392" 393" 394" 395" 396" 397" 398" 399" 400" 401" 402" 403" 404" 405" 406" 407" 408" 409" 410" 411" 412" 413" 414" 415" 416" 417" 418" 419" 420" 421" 422" 423" 424" 425" 426" 427" 428" 429" 430" 431" 432" 433" 434" 435" 436" 437" 438" 439" 440" 441" 442" 443" 444" 445" 446" 447" 448" 449" 450" 451" 452" 453" 454" 455" 456" 457" 458" 459" 460" 461" 462" 463" 464" 465" 466" 467" 468" 469" 470" 471" 472" 473" 474" 475" 476" 477" 478" 479" 480" 481" 482" 483" 484" 485" 486" 487" 488" 489" 490" 491" 492" 493" 494" 495" 496" 497" 498" 499" 500" 501" 502" 503" 504" 505" 506" 507" 508" 509" 510" 511" 512" 513" 514" 515" 516" 517" 518" 519" 520" 521" 522" 523" 524" 525" 526" 527" 528" 529" 530" 531" 532" 533" 534" 535" 536" 537" 538" 539" 540" 541" 542" 543" 544" 545" 546" 547" 548" 549" 550" 551" 552" 553" 554" 555" 556" 557" 558" 559" 560" 561" 562" 563" 564" 565" 566" 567" 568" 569" 570" 571" 572" 573" 574" 575" 576" 577" 578" 579" 580" 581" 582" 583" 584" 585" 586" 587" 588" 589" 590" 591" 592" 593" 594" 595" 596" 597" 598" 599" 600" OR Width : 8" 9" 10" 11" 12" 13" 14" 15" 16" 17" 18" 19" 20" 21" 22" 23" 24" 25" 26" 27" 28" 29" 30" 31" 32" 33" 34" 35" 36" 37" 38" 39" 40" 41" 42" 43" 44" 45" 46" 47" 48" 49" 50" 51" 52" 53" 54" 55" 56" 57" 58" 59" 60" 61" 62" 63" 64" 65" 66" 67" 68" 69" 70" 71" 72" 73" 74" 75" 76" 77" 78" 79" 80" 81" 82" 83" 84" 85" 86" 87" 88" 89" 90" 91" 92" 93" 94" 95" 96" 97" 98" 99" 100" 101" 102" 103" 104" 105" 106" 107" 108" 109" 110" 111" 112" 113" 114" 115" 116" 117" 118" 119" 120" 121" 122" 123" 124" 125" 126" 127" 128" 129" 130" 131" 132" 133" 134" 135" 136" 137" 138" 139" 140" 141" 142" 143" 144" 145" 146" 147" 148" 149" 150" 151" 152" 153" 154" 155" 156" 157" 158" 159" 160" 161" 162" 163" 164" 165" 166" 167" 168" 169" 170" 171" 172" 173" 174" 175" 176" 177" 178" 179" 180" 181" 182" 183" 184" 185" 186" 187" 188" 189" 190" 191" 192" 193" 194" 195" 196" 197" 198" 199" 200" 201" 202" 203" 204" 205" 206" 207" 208" 209" 210" 211" 212" 213" 214" 215" 216" 217" 218" 219" 220" 221" 222" 223" 224" 225" 226" 227" 228" 229" 230" 231" 232" 233" 234" 235" 236" 237" 238" 239" 240" 241" 242" 243" 244" 245" 246" 247" 248" 249" 250" 251" 252" 253" 254" 255" 256" 257" 258" 259" 260" 261" 262" 263" 264" 265" 266" 267" 268" 269" 270" 271" 272" 273" 274" 275" 276" 277" 278" 279" 280" 281" 282" 283" 284" 285" 286" 287" 288" 289" 290" 291" 292" 293" 294" 295" 296" 297" 298" 299" 300" 301" 302" 303" 304" 305" 306" 307" 308" 309" 310" 311" 312" 313" 314" 315" 316" 317" 318" 319" 320" 321" 322" 323" 324" 325" 326" 327" 328" 329" 330" 331" 332" 333" 334" 335" 336" 337" 338" 339" 340" 341" 342" 343" 344" 345" 346" 347" 348" 349" 350" 351" 352" 353" 354" 355" 356" 357" 358" 359" 360" 361" 362" 363" 364" 365" 366" 367" 368" 369" 370" 371" 372" 373" 374" 375" 376" 377" 378" 379" 380" 381" 382" 383" 384" 385" 386" 387" 388" 389" 390" 391" 392" 393" 394" 395" 396" 397" 398" 399" 400" 401" 402" 403" 404" 405" 406" 407" 408" 409" 410" 411" 412" 413" 414" 415" 416" 417" 418" 419" 420" 421" 422" 423" 424" 425" 426" 427" 428" 429" 430" 431" 432" 433" 434" 435" 436" 437" 438" 439" 440" 441" 442" 443" 444" 445" 446" 447" 448" 449" 450" 451" 452" 453" 454" 455" 456" 457" 458" 459" 460" 461" 462" 463" 464" 465" 466" 467" 468" 469" 470" 471" 472" 473" 474" 475" 476" 477" 478" 479" 480" 481" 482" 483" 484" 485" 486" 487" 488" 489" 490" 491" 492" 493" 494" 495" 496" 497" 498" 499" 500" 501" 502" 503" 504" 505" 506" 507" 508" 509" 510" 511" 512" 513" 514" 515" 516" 517" 518" 519" 520" 521" 522" 523" 524" 525" 526" 527" 528" 529" 530" 531" 532" 533" 534" 535" 536" 537" 538" 539" 540" 541" 542" 543" 544" 545" 546" 547" 548" 549" 550" 551" 552" 553" 554" 555" 556" 557" 558" 559" 560" 561" 562" 563" 564" 565" 566" 567" 568" 569" 570" 571" 572" 573" 574" 575" 576" 577" 578" 579" 580" 581" 582" 583" 584" 585" 586" 587" 588" 589" 590" 591" 592" 593" 594" 595" 596" 597" 598" 599" 600"
Length : 8" 9" 10" 11" 12" 13" 14" 15" 16" 17" 18" 19" 20" 21" 22" 23" 24" 25" 26" 27" 28" 29" 30" 31" 32" 33" 34" 35" 36" 37" 38" 39" 40" 41" 42" 43" 44" 45" 46" 47" 48" 49" 50" 51" 52" 53" 54" 55" 56" 57" 58" 59" 60" 61" 62" 63" 64" 65" 66" 67" 68" 69" 70" 71" 72" 73" 74" 75" 76" 77" 78" 79" 80" 81" 82" 83" 84" 85" 86" 87" 88" 89" 90" 91" 92" 93" 94" 95" 96" 97" 98" 99" 100" 101" 102" 103" 104" 105" 106" 107" 108" 109" 110" 111" 112" 113" 114" 115" 116" 117" 118" 119" 120" 121" 122" 123" 124" 125" 126" 127" 128" 129" 130" 131" 132" 133" 134" 135" 136" 137" 138" 139" 140" 141" 142" 143" 144" 145" 146" 147" 148" 149" 150" 151" 152" 153" 154" 155" 156" 157" 158" 159" 160" 161" 162" 163" 164" 165" 166" 167" 168" 169" 170" 171" 172" 173" 174" 175" 176" 177" 178" 179" 180" 181" 182" 183" 184" 185" 186" 187" 188" 189" 190" 191" 192" 193" 194" 195" 196" 197" 198" 199" 200" Width : 8" 9" 10" 11" 12" 13" 14" 15" 16" 17" 18" 19" 20" 21" 22" 23" 24" 25" 26" 27" 28" 29" 30" 31" 32" 33" 34" 35" 36" 37" 38" 39" 40" 41" 42" 43" 44" 45" 46" 47" 48" 49" 50" 51" 52" 53" 54" 55" 56" 57" 58" 59" 60" 61" 62" 63" 64" 65" 66" 67" 68" 69" 70" 71" 72" 73" 74" 75" 76" 77" 78" 79" 80" 81" 82" 83" 84" 85" 86" 87" 88" 89" 90" 91" 92" 93" 94" 95" 96" 97" 98" 99" 100" 101" 102" 103" 104" 105" 106" 107" 108" 109" 110" 111" 112" 113" 114" 115" 116" 117" 118" 119" 120" 121" 122" 123" 124" 125" 126" 127" 128" 129" 130" 131" 132" 133" 134" 135" 136" 137" 138" 139" 140" 141" 142" 143" 144" 145" 146" 147" 148" 149" 150" 151" 152" 153" 154" 155" 156" 157" 158" 159" 160" 161" 162" 163" 164" 165" 166" 167" 168" 169" 170" 171" 172" 173" 174" 175" 176" 177" 178" 179" 180" 181" 182" 183" 184" 185" 186" 187" 188" 189" 190" 191" 192" 193" 194" 195" 196" 197" 198" 199" 200"